Interesting questions! The questions this incident raises aren’t entirely unknown in concepts of speech in classical liberalism and I, for one, hope there’s some conversation here about the nuances. For instance, how does this incident compare to other incidents where citizens of different countries get political leaders embroiled in ideological conflicts as opposed to this one where the leaders threaten citizens of other countries who challenge their ideology? Also, where is the line between war and terrorism here? Me? I don’t think it’s a simple question of free speech, though that is where the vast majority of my concerns here lie. I also think that, offensive or not, threatening movie-going citizens with random bombings or whatever it was is flat out terrorism. 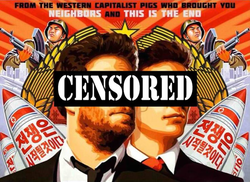 And worst of all, those actions made Seth Rogan and James Franco into the heroes of the moment of free speech.